My name is Nancy Finerty. I’m an SEIU member in The Dalles, Oregon. My job is to care for a woman named Karen, who receives services through Medicaid. Karen is 56 years old. She lives in The Dalles, raised two children on her own, and has multiple chronic conditions. She is bipolar with schizophrenia, diabetic, is blind in one eye and has glaucoma in the other. She walks with a walker and needs assistance to get in and out of cars, chairs, to walk stairs, to bathe, and to dress. If Karen were to lose her health insurance or her medications, she would lose her independence. She would be forced to move into a nursing home instead of living on her own. Even more frightening to her, without medication she would be unable to maintain relationships with her children, granddaughter, other family and friends. She would be isolated instead of living the independent and full life she does today — and I would lose my job. Measure 101 protects healthcare for people like Karen, and the other 1 million Oregonians on Medicaid, including 400,000 kids. 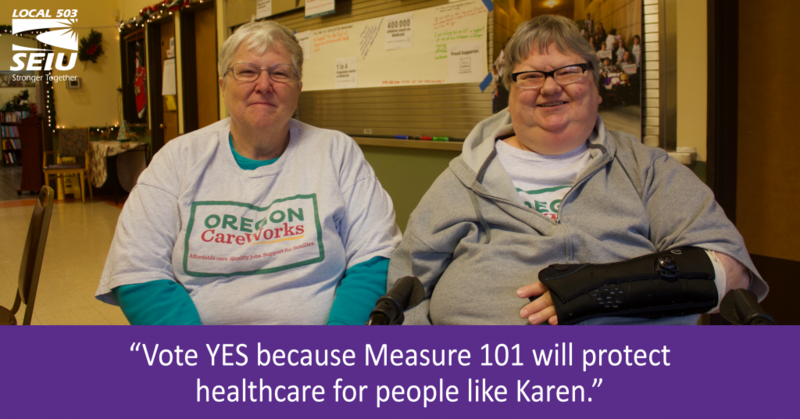 Click here for more information about how Measure 101 will impact SEIU members. I believe that healthcare is a right, not a privilege. Karen should be able to see a doctor when she is sick or injured, and she should have access to the long-term care that a person with chronic conditions requires. But without Medicaid, the cost of medication, in-home support workers, and doctor visits would be too much for Karen to handle. She would go broke, or worse, go without the healthcare she needs. In Oregon we have done a good job getting more people on health insurance. We must protect the progress we’ve made. That’s why I’m asking you to pledge to vote YES on Measure 101 in January.